In 1811 Chang and Eng Bunker were born in Siam (now known as Thailand). Joined at the chest by a ligament (soft tissue usually connecting two or more bones), the Bunkers toured the world as a side-show and circus attraction. They were billed as the "Siamese Twins" in reference to the country of their birth. Later on, this term was applied to all twins who were born joined together. The two brother lived to be 63 years of age and died within three hours of each other. 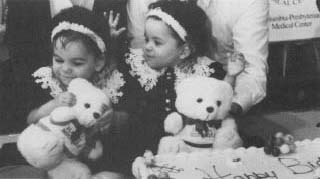 Siamese twins Carmen and Rosa Taveras celebrate their first birtay. The girls were successfully separated during an operation in 1993. Month-old Siamese twin boys recuperate after being surgically separated in Taipei, Japan. The twins had been joined at the chest. possible to save both lives. Generally, twins who are not separated have short life expectancies. One of the modern tools used to help save the lives of Siamese twins is computer-aided surgery (CAS). Using this technique, doctors create computer tomography (CT) images of the twins. Using these high-resolution pictures, surgeons can plan the separation of the twins because it is easier to really see what they will find. It is also possible for doctors to view the areas to be worked on from a number of different angles. These different views let them better understand what work will be needed and how best to perform the operation. 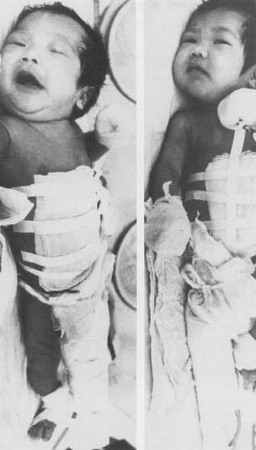 One of the most unusual cases of separating siamese twins occurred in Israel in 1995. Twin girls were born who were joined at their urological and intestinal tracts. Only six sets of twins had ever been reported born this way—four sets survived. Almost immediately after their birth, the twins were separated in a three hour-long surgery. After two additional hours of reconstructive surgery on their colons, small intestines, and bladders the doctors rested. While the surgery was a success at the outset, the long term prognosis (outcome) is still unknown.